A USDA loan is a great way to buy a house. The ability to borrow up to the home’s value at interest rates that are competitive with FHA and conventional loans make this a great option for first time home buyers. There are also new USDA income limits that make the USDA mortgage even better in the upcoming year. Unlike other mortgage loans, the USDA does not set a limit on the amount of the loan for a home. Instead, there is a limit to the amount of income that the borrowers can earn. The income is based on the total number of people living in the home. For example, a married couple with no children would have a lower income limit than a married couple with 3 children. The rules of USDA state that the family’s total gross income may not be more than 115% than the median average for their area. As of June 2018, USDA has increased most of the income limits across the majority of the country. Although each county across the country is unique, a family up to 4 people will have income limit around $82,000. And remember that USDA allows 115% of that amount, so a family could earn up to $94,300 and possibly still qualify for the loan. Most loans, like the FHA, VA and conventional loans will have maximum loan amounts. Lenders will explain these limits to potential clients to make sure they are shopping for homes that will fit with their chosen loan type. Whenever one of these loan types announce a new increase in loan limits, it stirs up business from new buyers. Higher loan amounts allow more people to qualify for loans and open up more opportunities across the country for lots of borrowers. In a similar fashion, the higher USDA income limits make it easier for a greater range of borrowers to qualify for a home loan. And the limits vary slightly from area to area, so some places will have even a higher income limit than the $82,000. With the increase in income limits and the availability of lending open to more borrowers, it means that more homes will be potentially available for purchase. USDA mortgages operate in a fashion similar to FHA loans. Local lenders are authorized by USDA to offer the loans, but the loans are guaranteed by the federal government. This means that your mortgage broker or mortgage bank will help you complete the loan application, pre-approve you for the mortgage loan, underwrite the application for final approval and send the loan package to the closing attorney. Other than the income limits previously mentioned, the main qualifying feature for a USDA loan is the property location. A home must be within an area that is labeled rural by the USDA property website. The word rural may bring a negative image to mind, but a large portion of the land in America is labeled rural. The easiest way to understand the term is to think of land in one of two ways. First, any home that is located extremely close to the main downtown area of a major city will not be considered rural. Think of a place like downtown Atlanta, or downtown Chicago, or downtown Miami. Secondly, an area on the outskirts of that same town would likely be considered as rural. The USDA website will allow users to input a physical address to find out if that particular home meets the rural requirement. Along with the income limits and rural designation, qualifying for a USDA home is fairly simple. The program will approve borrowers with average credit scores for a home purchase. There is also the requirement for proving income with paystubs, tax returns, and W-2 forms. USDA will approve loans for single-family homes. However, the USDA loan is not intended for income producing. USDA is also designated for owner-occupied homes. The loan cannot be used for investment properties or vacation homes. In order to continue offering loans with no down payment, the USDA needs funds to safeguard against foreclosures. These funds are generated with 2 kinds of fees. The first fee is charged at the loan closing. The fee is 1% of the original loan amount and will usually be added to the loan amount and financed over the term of the loan. The second fee is the annual fee. This fee is 0.35% of the outstanding loan balance and is charged once per year. The amount is divided by 12 and added to the regular loan amount. The annual fee is charged each year until the loan is either paid off or refinanced with a different type of mortgage. 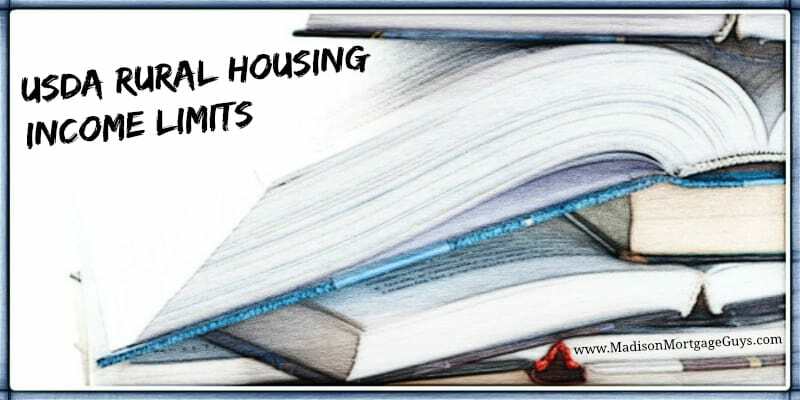 The USDA has announced the income limits for the Guaranteed Rural Housing (GRH) Program have changed effective June 13, 2018. Since 2009 income limits are based on a two tier income structuring consisting of a 1 – 4 member household and a 5 – 8 member household which replaced the 1 – 8 person structure in 2008. As a reminder, unlike other home-financing programs, there are no loan limits for the USDA Guaranteed Rural Housing Program. The maximum loan amount for USDA Guaranteed Rural Housing applicants is based on their ability to meet the repayment ratios for the program, while simultaneously staying within the program’s income limits. Income limits are again displayed in an 8 tier format, however, the moderate income level is still based on a 2 tier level. View http://www.rd.usda.gov/files/RD-GRHLimitMap.pdf (pdf) for all state’s income limits.